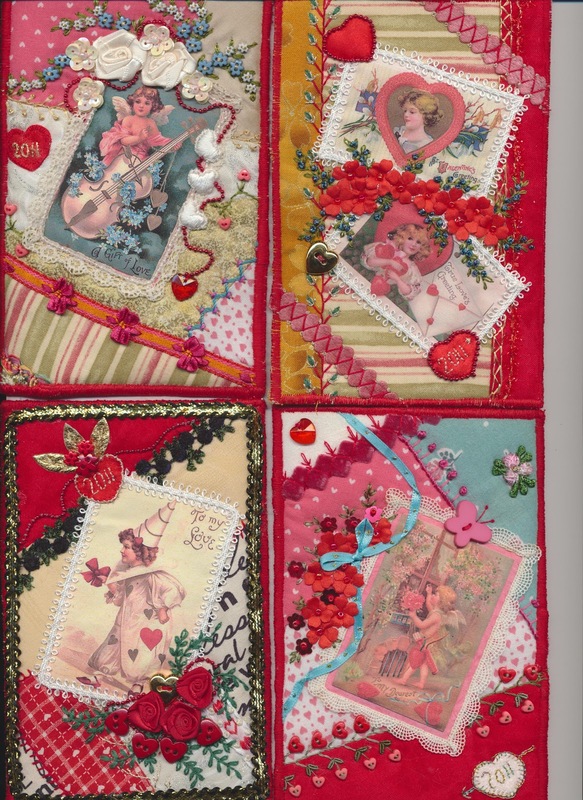 I have spent the last three hours holed up in my studio finishing off these seven Valentine's Day Fabric postcards for a swap with my SouthernCrossCrazies group. I really only needed to make five, four to swap and one to keep for myself but I know a couple of people who could do with a cheer-up so I made two extra. I really enjoyed this challenge as it gave me a chance to use up all my little red bits and pieces which I would never use otherwise. I rarely use red in crazy quilting as it is not one of my favourite colours. I decided to stay with traditional crazy quilting this time seeing as last time with the Autumn leaves I went waaaaaay out of my comfort zone. These cards are all "romantic" based on the printed images which I got from Flights of Fancy Boutique. I've been waiting for an opportunity to use them. I made four vertical postcards and three horizontal postcards and the one I have chosen to keep for myself is vertical one at the top right-hand corner with the two small images. 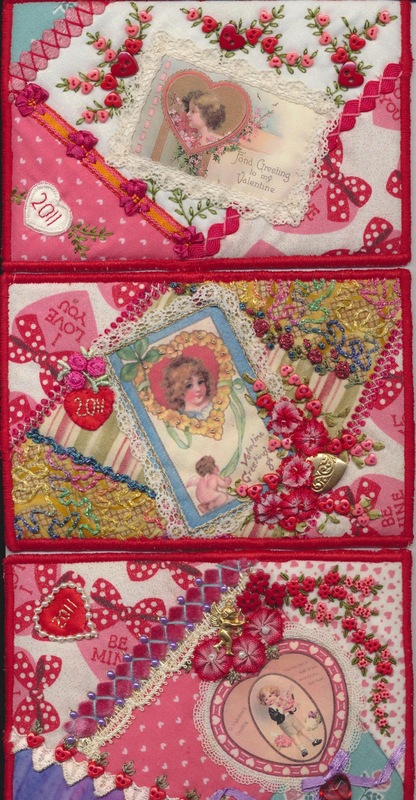 I just love how you used the tiny heart buttons as flowers. Wonderful! Viv, your cards are exquisite!!! I love the beautiful embroidery stitches you've used - a couple I've never seen before. These are so very sweet and romantic! Oh such wonderful cards everyone! Thankyou everyone for your nice comments on the postcards. They have all gone out in the post now and are travelling to their new owners. I had a really fun time doing them and am a bit sad to see them go actually. These are so completely adorable! Your works are fantastic. 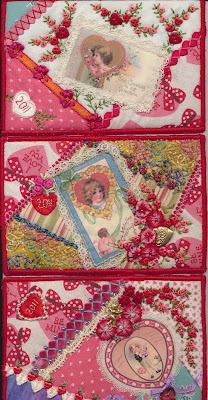 I have also enjoyed crazy quilting since the first time I saw it. These are absolutely beautiful! Nice work!